A leaked document has made public some future plans of Microsoft in regards to Xbox 720, Kinect 2, and Kinect Glasses. The 56-page document leaked to Scribd has now been removed “at the request of Covington & Burling LLP,” an international law firm that lists Microsoft as one of its clients. But we still have some details to share with you. Xbox 720 will feature six or eight ARM or x86 cores clocked at 2GHz each with 4GB of DDR4 memory alongside three PPC cores clocked at 3.2GHz each for backwards compatibility with existing Xbox 360 titles. The image below shows a part of the leaked document. Microsoft calls Xbox 720 the “only box” for living room entertainment. The price of the product is noted to be around $299, which will include Kinect 2 hardware. Kinect 2 is expected to have better accuracy and voice recognition, and support for four-player games. It would also feature dedicated hardware processing and an obviously improved camera. ‘Kinect Accessories’ are also planned to replace controllers (like a baseball bat for a baseball game). Project Fortaleza features ‘Kinect Glasses’ which looks similar to ‘Google Glasses’, a Google product which is under development and has been widely discussed about recently. 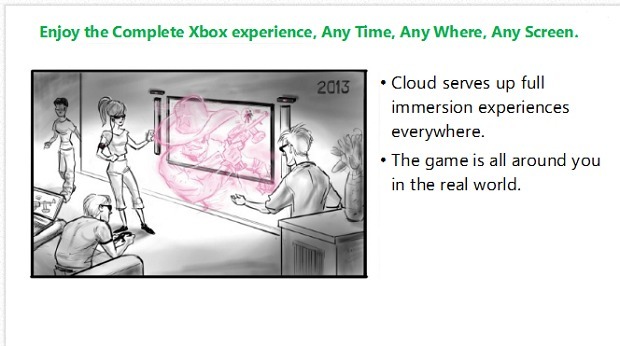 Kinect Glasses, which is expected to come out in 2014, is not well described in the leaked document.